turned on a similar lathe called a “swash” lathe, the result is “swash” work. In the dictionary it gives this definition of a swash plate - "an inclined disk revolving on an axle and giving reciprocating motion to a part in contact with it." I can't get over how skilled and patient these guys must have been to get any kind of result (can the operator actually see what's happening at the cutting edge ?) and it's good to see an example of something actually turned on one. 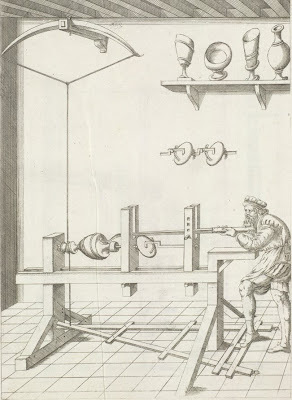 Here's a link to Besson's book at the Smithsonian Institution Libraries which contains many other engravings of weird and wonderful contraptions. Peter also said "Let me know when you get one up & running, I’d love to see it in action." Don't hold your breath . . .